Sadly, Cobra #21 is the last issue of the series. But, in typical fashion of this book, it goes out with a bang and a boom!! !…and some unsolved mysteries. Writer Mike Costa does just what he’s done with this title for years. He makes it awesome, plain and simple. Let’s face it, everyone thinks that their villains are the most interesting characters, but Costa PROVES it! There’s just about everything that there should be in a book about Cobra. Mysteries, betrayal, crime, etc. It’s hard to really put this book into any kind of genre. It’s part crime, part superhero, part drama. It’s basically a catch-all of everything that you love about comics. While you’d think there’s MORE than enough material to do a book about NOTHING but Cobra, Costa throws in a couple of fan-favorite Joes, that should make everyone happy. I’m sad to see this book go, but it’s been a great ride. Thank you, Mike Costa! Very few comics can pick up right where they left off 20 years ago and still maintain the level of creative goodness that G.I. Joe A Real American Hero #179 does. I believe that’s due in part to the creative team, but also to the minds of the audience. All it takes is opening the cover and you’re right back where you were a couple of decades ago. Sure, you might have a kid or two, a family, a house of your own. But inside we’re all the same 10 or 12 year old kids that loved reading this book. The book hasn’t changed. We have. A little. Every G.I. Joe fan needs to buy Larry Hama a drink. If for nothing else, for the fact that he’s just awesome. This issue is action from cover to cover. I’ll be honest with you, there’s not much Joe action here, it’s a Cobra-centric issue as the forces of Cobra take on the Blue Ninja Clan, with the help of a Joe or two. Right now is a fantastic time to be a G.I. Joe fan (unless you collect the toy line). 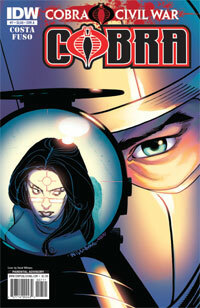 Although, after reading Cobra #8, it’s a better time to be a Cobra fan. 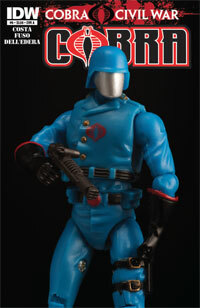 The new Cobra Commander has been chosen and he means business. And, he’s not wasting any time. You’ve got to hand it to writer Mike Costa. He makes being a bad guy look like a hell of a lot of fun. 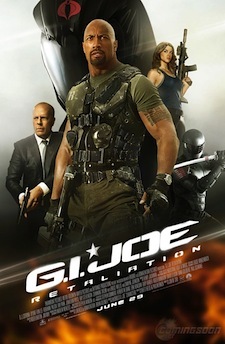 When I was a kid, I always wanted to part of the G.I. Joe team. My great fear is that kids reading the G.I. Joe comics today will see that being a member of Cobra is a lot more interesting, and in about 20 years, we’ll have thousands of young men starting up their own ruthless, terrorist organization. But I digress. WOW! Cobra #7 is really gonna put you on the edge of your seat! 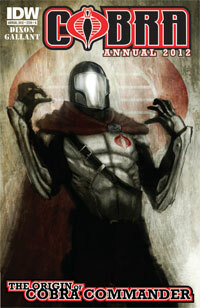 While we don’t find out who the new Cobra Commander is — that happens next month in G.I. Joe #8 — we do get some big time payoff. It’s getting down to the wire and business is picking up! Mike Costa does a great job writing what basically ends up being Die Hard in the G.I. Joe headquarters. Secrets are revealed, the body count rises, and the person that I thought was gonna be Cobra Commander is….well, let’s just say it’s not going to be who I thought it was. 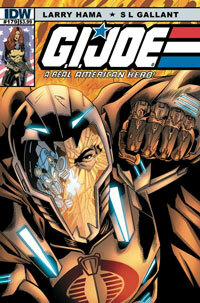 Just an all around great issue for the penultimate chapter of this year-long storyline. After this issue, the dynamic of this whole book is going to change a full 180 degrees. I can’t wait to see where it goes next. There are a lot of great comic book art blogs out there, beyond the deviantart pages of the world, and if you’re a comic book fan, these are webpages that you should be checking out on a daily basis. This week, I’m going to highlight a few that I think are worthy of your attention or are just pages for some of my favorite artists. 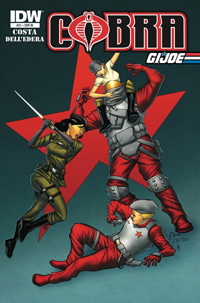 We start with Robert Atkins Art, the webpage for Robert Atkins, currently on the Snake Eyes ongoing from IDW, formerly of the main GI Joe series. Atkins has also done work on Amazing Spider-Man, Ultimate Fantastic Four, and others. Atkins has really stepped up his game on his webpage in the last few months, updating the site almost every day with sketches of various characters from across pop culture. He also chooses specific themes for each week, giving him a chance to stretch his muscles. What’s the best part about this blog? Almost all of the sketches he posts are for sale at decent prices, so if you’re a fan of original art, you have to check this out. There are several pieces on the site that I am kicking myself for not buying.